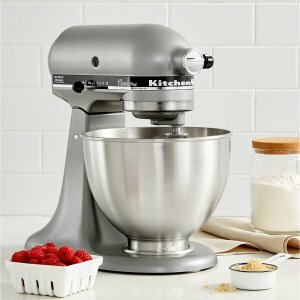 Amazon.com offers the KitchenAid KSM75SL 4.5 Qt. Classic Plus Stand Mixer for $170. Features: Make up to 6 dozen cookies in a single batch with the KitchenAid classic plus series 4.5 quart Tilt-Head stand mixer. This mixer also features 10 speeds to thoroughly mix, knead and whip ingredients quickly and easily. For even more versatility, use the power hub to turn your stand mixer into a culinary center with over 10 optional hub powered attachments, from food grinders to pasta makers and more.